On September 1st 1939 the invasion of Poland by the Nazi troops marked the onset of the Second World War. Pursuing its mission to alleviate the sufferings of war victims, the International Committee of the Red Cross immediately responded to the outbreak of hostilities. In a letter sent to the belligerents on September 2nd 1939, the organization laid down its plan for action, revolving around the protection of medical personnel, prisoners of war and civilian internees, the exchange of seriously sick and wounded soldiers, the development of safety zones, and the protection of civilians in enemy hands. 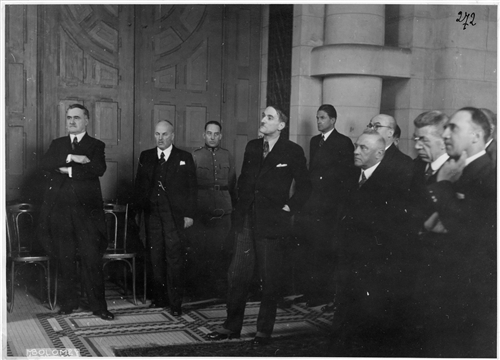 Delegates were appointed to carry out those missions and were sent out to the countries at war. Faced with the dramatic humanitarian consequences of the war, the ICRC expanded the scope of its activities to assist civilian populations as well. In collaboration with National Societies of the Movement of the International Red Cross and Red Crescent, the humanitarian organization launched major relief operations for the populations suffering bombings, ethnic and religious persecutions, famine, and occupation. In its tireless work to remedy the human consequences of the war, the organization soon faced severe challenges and obstacles. It was forced to navigate the restrictive policies of belligerent governments, including being prohibited to access certain camps, and its resources were stretched thin by the ever-increasing scale of the conflict and growing number of affected populations. Most notably, the ICRC failed to fully combat or publicly condemn the Nazi genocide and persecutions before 1943, as the second section of the guide will present. Conceived as an entry point into the ICRC Library and Archives’ rich collections, this research guide aims to provide an overview as comprehensive as possible of the main documentary resources available on the activities of the ICRC during the war. Each of the following sections is dedicated to a specific field of action of the organization, listing both primary sources and related works of secondary literature. All the publications presented here are available for consultation in the ICRC Library. Some have also been digitized and are fully available online (see the links provided for more details). The guide also includes a first – non-exhaustive – selection of fonds from the ICRC archives, with links to the inventories available online. Unpublished sources from these public archives can be consulted upon appointment at the institution’s headquarters in Geneva; see the service’s webpage for more information. The guide also provides links to the photos and films available online on the ICRC audiovisual archives portal. Additional reading suggestions are provided, as well as a series of relevant online resources (including complementary research guides, online platforms, and digitized archival collections from academic, cultural or heritage organizations). The publication of this guide follows the digitization of a series of source materials related to the activity of the ICRC during WWII and for which direct links are included below. Submitted to the 17th International Red Cross Conference in August 1948, this report in three volumes documents the activities of the ICRC from the outbreak of the war on September 1st 1939 to June 30th 1947. The first volume opens with an article by Max Huber, ICRC President from 1928 to 1944, titled “Principles and foundations of the work of the International Red Cross”. It then gives an overview of the ICRC’s different departments and delegations around the world and their cooperation with National Red Cross Societies for the duration of the conflict. The rest of the volume describes the organization’s activities for the protection of wounded and sick soldiers, of prisoners of war and affected civilian populations. The second volume of the report deals specifically with the work of the Central Prisoners of War Agency. It notably describes how its research service expanded the scope of its work to cover missing civilians as well as prisoners, at a time when international humanitarian law did not contain any provisions related to the protection of civilian populations during armed conflicts. Faced by an increasing number of inquiries about missing persons, the Agency worked to collect, centralize and spread information on the fate of interned or deported civilians as well as prisoners of war. The third volume of the report presents the relief operations launched by the ICRC to assist war victims and outlines the technical and operational difficulties faced by the organization in that domain. Finally, a volume of annexes compiles a series of tables and statistics on the ICRC’s relief actions during the conflict. This report is also available in French and in Spanish. Also available in French, German, Spanish and Russian, this study authored by Frédéric Siordet provides an introduction to the activities of the ICRC during the conflict. Redacted in 1947 at the organization’s request, it aimed to give National Red Cross and Red Crescent Societies, governments and the general public, a concise but comprehensive account of its work and the conditions under which it was done, before the publication of the report in three volumes included above. 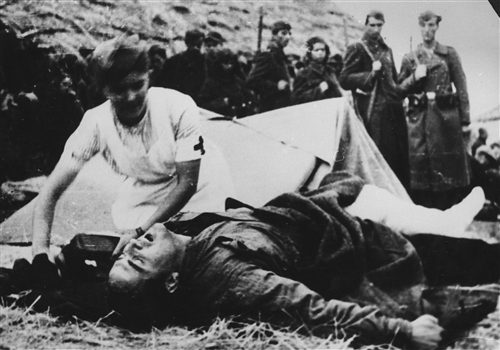 Film counterpart of the publication, Inter arma caritas (1948) is almost entirely composed of extracts of documentary films shot by the ICRC and National Red Cross Societies during the war. Widely distributed at the time, the film is now available online on the ICRC’s audiovisual archives portal. The different editions of this journal published by the ICRC between April 1943 and December 1949 to document its activities have been reunited in a series of four volumes, available for consultation in the ICRC Library. The second edition of the News of the International Red Cross is also available in English, German and Spanish. Digitized and available for consultation online, the 1939 – 1945 editions of the Review comprise many articles on the ICRC’s activities during the war, from its visits to prisoner camps to relief actions for war refugees and the repatriation of sick and injured soldiers. Access here the entire ICRC audiovisual fonds and collections (movies, photos and sounds) related to the Second World War. For a comprehensive overview of the ICRC’s development from 1911 to 1945, see André Durand’s History of the International Committee of the Red Cross: from Sarajevo to Hiroshima (1984). This second volume of the series describes the organization’s constant efforts to fight the development of ever more inhumane means of waging war, to conduct relief operations on an unprecedented scale, and protect new categories of war victims, in an era marked by the uninterrupted succession of global, international and civil wars. François Bugnion’s study The International Committee of the Red Cross and the Protection of War Victims, which tracks the evolution of the organization’s mandate as the guardian and promoter of international humanitarian law, also includes a chapter on the ICRC’s work during the war. In French, see also Michela Colucci’s chapter Le rôle du Comité International de la Croix Rouge (CICR) durant la Seconde Guerre mondiale and Gérard Chauvy’s volume on the work of National Red Cross Societies during the war, La Croix-Rouge dans la guerre : 1935-1947 (2000). The organization’s neutrality in its diplomatic relations with belligerent or neutral countries has also been studied. In 2012, Isabelle Vonèche Cardia published Neutralité et engagement : les relations entre le Comité international de la Croix-Rouge (CICR) et le gouvernement suisse (1938-1945). In this volume, the historian looks at the ICRC’s decision-making processes during the conflict. She presents the institution’s qualms about departing from the framework for its action provided by international law and discusses the weight of its relationship with the Swiss federal government. Her analysis of the relation between Bern and Geneva, however, departs from the traditional thesis that the ICRC was dependent on the Swiss Confederation, rather stressing their very similar viewpoints and values at the time. 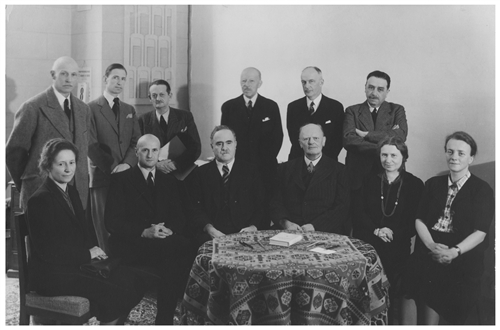 Historian James Crossland’s PhD thesis provides an in-detail analysis of the relation of the ICRC with the British government from 1939 to 1945. His articles A man of peaceable intent: Burckhardt, the British and Red Cross neutrality during the Second World War (2011) and Expansion, suspicion and the development of the International Committee of the Red Cross: 1939-45 (2010) also address part of the criticism received by the ICRC on its position during the war. Two theses by graduate students focus on related topics ; see Stéphanie Riesen, Les relations entre le CICR et le gouvernement anglais pendant la Seconde Guerre Mondiale (2002) and Nadine Fink, Le Comité international de la Croix-Rouge face à l’internement des militaires français en Suisse 1940-1944. Une approche des relations entre le CICR et les autorités fédérales (1998). In 1975, the ICRC published some of the more important documents available in its archives related to its work in favor of the detainees of German concentration camps. The volume notably includes extracts of the ICRC’s correspondence with government officials and National Red Cross Societies. These sources recount the organization’s efforts to visit and develop relief actions for the camps’ detainees and the severe difficulties it faced in this domain. The volume also comprises reports of visits to the camps, when the presence of ICRC delegates was in very rare occasions allowed. Maurice Rossel’s June 23rd 1944 visit to the Theresienstadt ghetto, now recognized as staged by the Nazi authorities to conceal the reality of the concentration camp system, has been the subject of many historical studies and debates (see the literature section below). To promote transparency, the ICRC’s archival materials related to Theresienstadt, including Maurice Rossel’s report, have been reunited in a volume now available at the Library. The archives have also established in April 2001 a chronology of this delegate’s activities during the war. Finally, the Beate Klarsfeld Foundation published in 1999 a collection of sources from the ICRC archives related to the fate of the Jews deported and detained in France. The publication of these collections of archival sources is a testament to the institution’s desire to encourage historical research on this chapter of its history, and to reply with absolute transparency to criticisms of its inaction in the face of the atrocities committed by the Nazi regime. 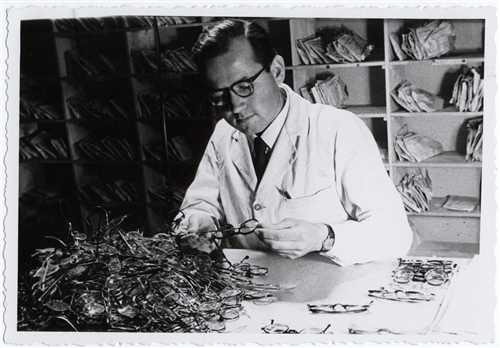 In 1979, the ICRC mandated historian Jean-Claude Favez to conduct a research study on its action for Holocaust victims, giving him unlimited access to its archives. Nine years later, Favez published The Red Cross and the Holocaust, first extensive study on the topic. To promote transparency and accountability, the ICRC decided in 1996 to open its archives covering the period 1863-1946 to historical research and the general public. Since then, its action for the victims of the Nazi persecutions and the Holocaust has been analyzed by multiple researchers. The ensuing literature gives a clear account of the many difficulties faced by the ICRC during this period, though it also brings to light the successful initiatives taken by delegates to help save or protect persecuted populations. Key studies on the topic also include Marc-André Charguéraud’s book L’étoile jaune et la Croix-Rouge : le Comité international de la Croix-Rouge et l’Holocauste, 1939-1945 (1999). A series of articles exploring different specific issues of the ICRC’s action have been published in research journals or included in historical volumes : see Fabrice Cahen’s Le Comité international de la Croix-Rouge (CICR) et les visites de camps : étude d’une controverse (2001) and articles by Sébastien Farré and Yan Schubert L’illusion de l’objectif : le délégué du CICR Maurice Rossel et les photographies de Theresienstadt (2009), The ICRC and the detainees in Nazi concentration camps (1942-1945) (2012) and From Sachsenhausen to Schwerin: the International Committee of the Red Cross (ICRC) and the death marches (2012). Auschwitz survivor Arieh Ben-Tov dedicated in 1997 a volume to the humanitarian aid provided by the ICRC to Hungarian Jews between 1941 and 1945. Dargo Arsenijevic’s book Voluntary hostages of the S.S. (1984) describes how ten ICRC delegates entered the camps of Mauthausen, Therensienstadt and Dachau in the last days of the war in order to try and prevent the mass extermination of all prisoners by the Nazi troops. The director of the renowned documentary film Shoah (1985) Claude Lanzmann transcribes in the book Un vivant qui passe his 1979 interview with former ICRC delegate Maurice Rossel, centered around the latter’s 1944 visit to the Theresienstadt ghetto. Historian Irène Herrmann, in her latest study L’humanitaire en questions : réflexions autour de l’histoire du Comité international de la Croix-Rouge (2018), reconsiders this problematic episode of the ICRC’s action during the Second World War as the illustration of the material, political and instrumental limits of humanitarian action. 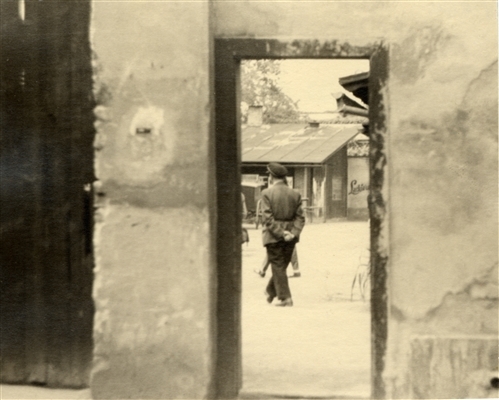 Recounting the historical context of the visit, Herrmann’s analysis leads to a re-examination of the ICRC’s motives behind the choice of the inexperienced delegate Maurice Rossel and of the report and photos he brought back from Theresienstadt. In 1942, the ICRC considered and debated the possibility to publicly denounce the persecution of Jewish populations by the Nazi regime, before finally deciding against it. Two articles by Maria Rodriguez-Bustelo (La décision du Comité International de la Croix-Rouge de ne pas lancer d’appel public contre la persécution des Juifs en octobre 1942 (1988)) and Isabelle Vonèche Cardia (Les raisons du silence du Comité international de la Croix-Rouge (CICR) face aux déportations (2015)) retrace the history of the ICRC’s internal debates on this issue and analyse the reasons behind its silence. 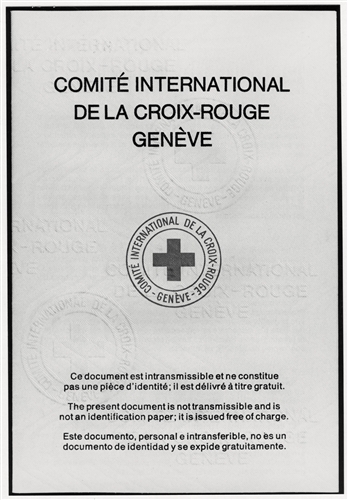 In 1996, the ICRC conducted an internal investigation on the work of some of its delegates during the war, after the publication of allegations in the press. Its findings were made public in a 1997 report authored by François Bugnion, Le Comité international de la Croix-Rouge infiltré par les Nazis ?. 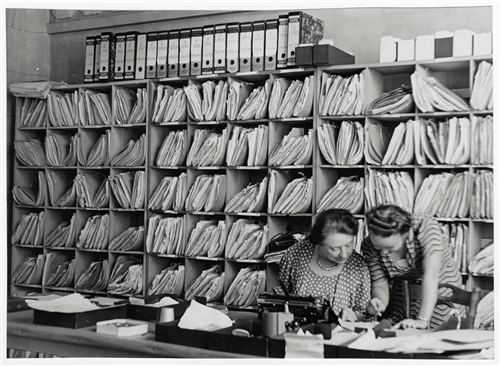 Finally, the volume Les archives de l’espoir, presents the work of the International Tracing Service in Arolsen mandated to answer requests for information from survivors and relatives of victims of the Nazi concentration camps up to the present day. This 2011 web article retraces the history of the collaboration between the ITS and the ICRC. As a humanitarian organization, the ICRC worked to provide protection and assistance to war victims and did not play the role of a commission of enquiry or of a statistics bureau during the Second World War. It thus never tried to compile statistics on the victims of the Nazi concentration camps, nor certified the accuracy of statistics produced by third parties. The allegations attributing to the ICRC the paternity of an estimated number of victims are thus falsified information and have been categorically and systematically denied by the institution since 1975. The Holocaust and the ICRC : page dedicated to the Holocaust on the blog of the ICRC delegation in Israel and the occupied territories with links to a series of online articles, news releases and ICRC statements. 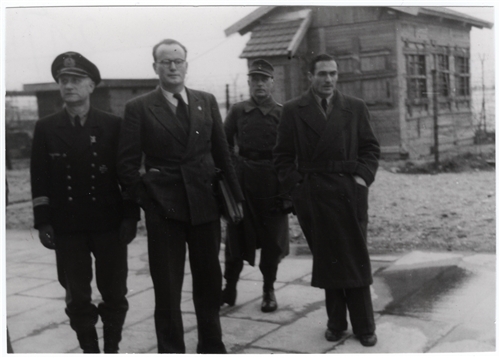 Dialogue with the past: the ICRC and the Nazi death camps : interview with former ICRC director for International Law and Cooperation within the Movement François Bugnion, published on the blog of the ICRC delegation in Israel and the occupied territories. Website of the Arolsen International Tracing Service. Collections of digitized archival materials related to the Shoah : Yad Vashem – World Center for Holocaust Research, The Wiener Collection – Tel Aviv University, The Holocaust: Key Documents from The British National Archives, Mémorial de la Shoah, Holocaust Denial on Trial (Emory University). Testimonies from victims of the Nazi persecutions : Chronicles of Terror (Witold Pilecki Center for Totalitarian Studies), Witnessing Genocide (The Polish Research Institute, Lund, Sweden), USC Shoah Foundation Visual History Archive (VHA), Oral History: Jewish Survivors of the Holocaust (The British Library), Voices of the Holocaust (The Galvin Library). On September 14th 1939, a mere two weeks after the outbreak of the war, the ICRC resumed the activities of its Central Agency for Prisoners of War. For the duration of the conflict, the Agency was in charge of the centralization of all information related to the fate of imprisoned or missing soldiers and its communication to their relatives. Every week from January 1940 to December 1947, the Agency published the Nouvelles de l’Agence centrale des prisonniers de guerre, a journal designed to keep the members of the ICRC informed on its work. The publication documents its internal organization, the information it received on prisoners of war and the statistics produced by its various departments on their activities. 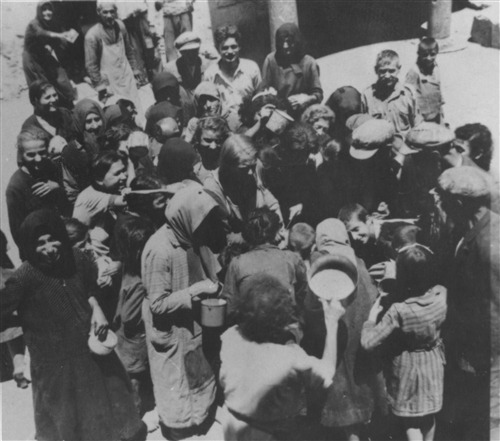 As the conflict assumed ever-increasing proportions and the number of prisoners of war and civilian internees multiplied, the ICRC carried out large-scale relief actions for their benefit. 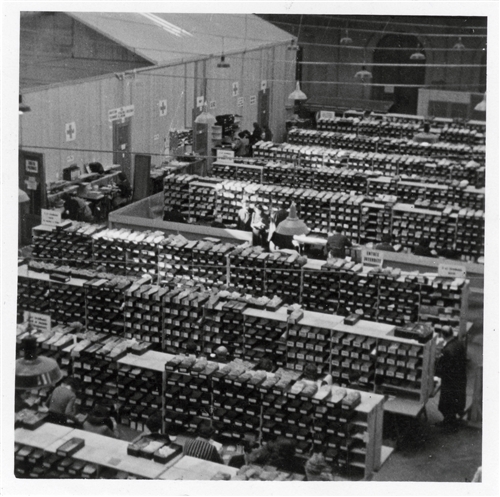 With numerous illustrations and photographs, a 1943 publication titled Relief for prisoners of war and civilian internees describes the preparation, content and transport of relief parcels by the institution. Acting as an impartial intermediary, the ICRC advocated for the rights of prisoners of war via diplomatic channels, as the 1946 Report on the efforts made by the International Committee in behalf of “partisans” taken by the enemy details. The ICRC’s medical division also published in 1950 a report titled Internal and contagious diseases in prisoner of war and civilian internee camps during the Second World War based on its delegates’ camp visits. 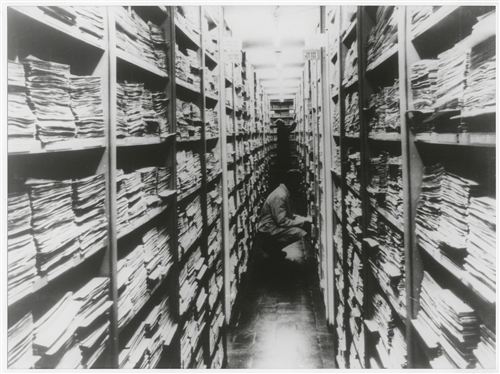 Individual data collected by the ICRC during past conflicts form the Agency archives. Requests for research about the fate of individual prisoners of war and civilian internees can be addressed to the affiliated service. For more information and contact details, see the following presentation of the service and the webpage Researching victims of conflict. The ICRC Library’s large collection on detention in times of conflict comprises historical works on its activities during the Second World War. It notably includes Gradimir Djurović’s The Central Tracing Agency of the International Committee of the Red Cross: activities of the ICRC for the alleviation of the mental suffering of war victims (1986), an extensive and detailed study on the work of the ICRC’s successive tracing agencies, from the 1870 Basle Agency to the present day. Three publications by Okawa Shiro (et al. ), Philip Towle (et al.) and Vasilis Vourkoutiotis focus on the treatment by the Japanese troops of their prisoners and analyze reports of Red Cross visits to the camps. 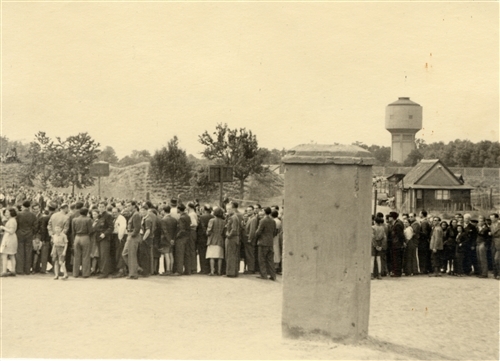 Christine Winter’s Limits of impartiality: the delegates of the International Committee of the Red Cross in Australia during the Second World War (2013) presents a case study of the Australian delegation’s services to civilian internees. In French, historian Delphine Debons studies the ICRC’s assistance to prisoners of war in her 2012 book L’assistance spirituelle aux prisonniers de guerre : un aspect de l’action humanitaire durant la Seconde Guerre mondiale and her 2009 article Le CICR, le Vatican et l’œuvre de renseignements sur les prisonniers de guerre : rivalité ou collaboration dans le dévouement ?. Finally, the Library holds copies of two master’s theses on the ICRC’s action for Second World War prisoners, respectively in Germany (Alexis Lachat, Le Comité International de la Croix-Rouge et la protection des prisonniers de guerre français en Allemagne durant la Seconde Guerre mondiale (1939-1944) and France (Delphine Leluc, “Ma chère Genève” : le CICR et les prisonniers de guerre coloniaux français, 1940-1946). Civilians also benefited from the Agency’s work for the restoration of family links and the alleviation of the mental sufferings caused by the war. 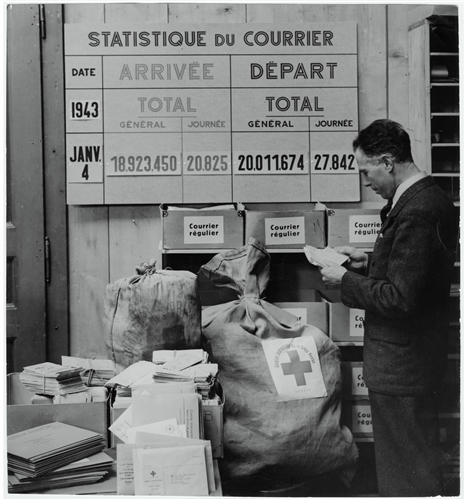 Marino Carnévalé-Mauzan’s article presents how the organization worked to facilitate the exchange of civil correspondences between the populations of countries at war, with thousands of Red Cross messages transiting daily through Geneva. The ICRC strove to assist the civilian populations affected by the war, including millions of refugees and evacuees, and collaborated to this end with the League of Red Cross Societies and the different National Societies of the Red Cross and Red Crescent Movement. Two commissions were at the forefront of those activities, the Joint Red Cross Relief Commission and the Management Commission for Relief Action in Greece. 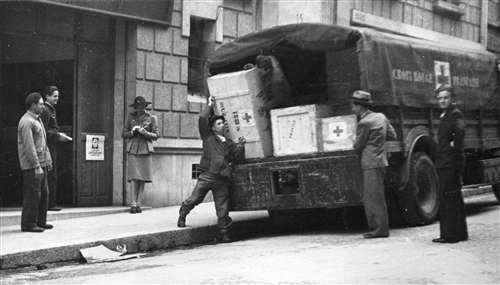 From 1939 to 1946, the Joint Relief Commission of the International Red Cross provided assistance to the civilian populations victims of the war. Composed of representatives of the International Committee and the League, this commission worked in collaboration with National Red Cross Societies to send out relief supplies (mainly food, clothes, medical and pharmaceutical supplies) to the affected populations. An electronic version of its final activity report published in 1948 is available here, describing in detail both its action and the obstacles it faced. Other publications by the commission include the activity reports published in 1943, 1944, 1945 and 1946 as well as the description of relief actions for children and women victims of the war (1941), children in Serbia (1944), and parcels for prisoners of war (intellectual relief (1944), glasses (1943) and dental prostheses (1944)). The summer of 1941 marks the beginning of a terrible famine in occupied Greece. Founded under the leadership of the ICRC in the fall, a dedicated commission worked to collect and distribute food to the Greek population. Three successive reports map the history of this commission: Commission de gestion des envois des vivres du Comité international de la Croix-Rouge en Grèce : rapport final de son activité : octobre 1941 – août 1942 (1945), Rapport sur la liquidation de la Commission de gestion des envois de vivres du CICR en Grèce : avril 1943 – février 1945 (1945), Ravitaillement de la Grèce pendant l’occupation 1941 – 1944 et pendant les premiers cinq mois après la libération : rapport final (1949). Related ICRC archival fonds : A CICR, série B SEC CGSG Management Commission for Relief Action in Greece (1940-1946), see also série D EUR GRECE1 Activities of the delegation in Greece during the Second World War (1940-1947). The ICRC’s audiovisual archives also document the organization’s relief efforts during the conflict. See online photographs retracing its activities in Greece (733 photos) and beyond (383 photos). The ICRC’s humanitarian action in Greece during World War II has been studied by R. Clarence Lang, Red Cross humanitarianism in Greece, 1940-45 (1989), Antoine Fleury, L’action humanitaire de la Suisse en Grèce pendant la Deuxième Guerre mondiale (1991), and Melissa Härtel, L’action du CICR en faveur des enfants grecs sous l’occupation : 1941-1944 (2003). In 1996, Andrei Siperco dedicated a volume to Red Cross action in Romania from 1939 to 1944. Included in the study Mémoires croisées autour des deux guerres mondiales (2012), a chapter by Daniel Palmieri and Fania Khan Mohammad titled Des morts et des nus : le regard du CICR sur la malnutrition extrême en temps de guerre (1940-1950) investigates the way victims of the Greek famine and French prisoners of war are represented in photographs. In the early hours of August 6th 1945, an American bomber dropped the first atomic bomb in history over Hiroshima, leaving the city in ruins and decimating its population. The publications included here document the ICRC’s efforts to assist the victims and, from 1945 to the present day, to fight the development and use of mass destruction weapons. 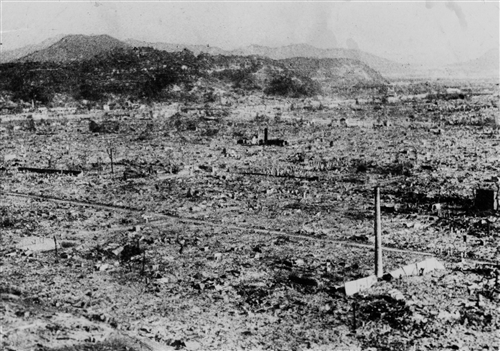 On August 29th 1945, the ICRC delegate Fritz Bilfinger was among the first foreigners to ever witness the devastation wrought by the atomic bomb in Hiroshima. The next day, he sent a telegram to the ICRC delegation in Tokyo describing the horrific conditions and calling for immediate relief action. His report, dated October 24th 1945, details the effects of the atomic bomb, as he witnessed them a mere three weeks after the attack. ICRC delegate in the Far East at the end of the Second World War, Marcel Junod is the first foreign doctor to assist the victims of the explosion. This text found among his personal papers after his death offers a striking testimony of the horrors he witnessed. A CICR, sous-fonds A CL – 16.006.02 – Atomic bombing on Hiroshima: report by Fritz Bilfinger, ICRC delegate in Tokyo (10.24.1945); extract from a note by Dr Marcel JUNOD (11.11.1948). A CICR, série B G 079 Chemical war, gas (1936-1950). A CICR, série D AO JAPON1 Activities of the ICRC delegation in Japan, Second World War (1942-1946). Nuclear weapons raise fundamental questions which go to the very heart of international humanitarian law and of Red Cross assistance activities. Sixty years after Hiroshima and Nagasaki, the author describes how the ICRC still combats the development and use of weapons of mass destruction. Hiroshima hospital director Michihiko Hachiya gives a day to day account of the two months that followed the bombing and of his work to help the victims in the devastated city. In French, the articles Un geste d’humanité à Hiroshima (Jean-François Berger, 2013), Il y a cinquante ans, Hiroshima… (François Bugnion, 1995) and Témoin de l’indicible : le Dr Marcel Junod à Hiroshima (François Bugnion, 2007) recount the work of Marcel Junod, central figure of the ICRC from the mid-1930s to the end of the Second World War. The 2005 volume Soixante ans après: le désastre de Hiroshima de Marcel Junod, directed by Erika Deubler Ziegler, includes Junod’s original report and supplements it with studies of the disaster’s historical context. François Bugnion dedicates a chapter of the book to the impact of the nuclear threat on the respect of the rules and principles of international humanitarian law. Available on the audiovisual archives portal, three recent documentary films detail the ICRC’s work to prevent the spread of nuclear weapons and assist the victims of the 1945 bombings : Japan, 70 years later, new fatal illnesses linked to nuclear bomb exposure (2015), La catastrophe humanitaire d’une bombe nucléaire (2015), Marcel Junod, le troisième combattant : deuxième partie (1939-1945) (2013). Collections of digitized archival materials related to the bombings of Hiroshima and Nagasaki: Harry S. Truman Presidential Library, National Security Archives of the George Washington Library, Avalon Project at the Yale Law School Lillian Goldman Law Library. After the hostilities ended, the ICRC continued to help the populations suffering from the war while the Central Prisoners of War Agency carried on its action for the tracing of the missing and the identification of the dead. The repatriation of refugees, stateless persons, former prisoners of war and civilian internees also became a central concern of the institution at that time. 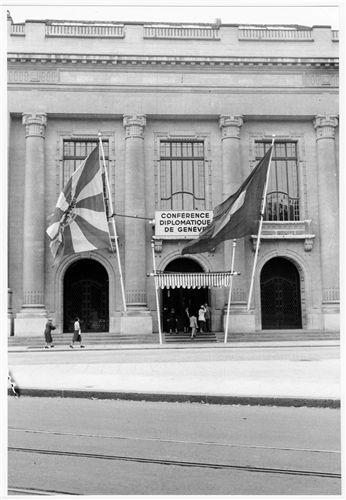 Geneva, Diplomatic Conference for the revision of the Geneva Conventions, August 12th 1949. 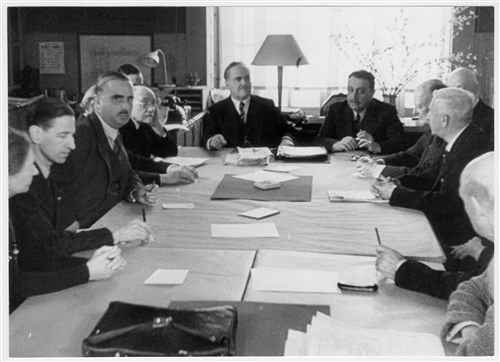 As the war came to an end, the ICRC resumed its effort on the international scene to improve the protection of war victims under international law, pressing for the revision of the existing Geneva Conventions and the adoption of a new convention relative to the protection of civilian populations. For more information about the development of international humanitarian law after the war, see the ICRC Library’s research guide Drafting history of the 1949 Geneva Conventions. This report, entirely available online, aims to give an overview of the organization’s activities during the early postwar period. Part I deals with the organization of the ICRC and its work arising out of the World War; part II with its action for the victims of this period’s emerging conflicts; part III with its role in the development of international law and its relations with various governmental and non-governmental agencies. During its fifth session, the United Nations General Assembly adopted three resolutions calling upon the services of the ICRC and the League of Red Cross Societies. They concerned the repatriation of Greek military personnel in captivity, that of displaced Greek children and the fate of prisoners of war. Article 16 of the Peace Treaty signed on September 8th 1951 between Japan and the Allied Powers provided the ICRC with the responsibility to undertake the distribution of the fonds for the compensation of former prisoners of war and their families. This report presents how the institution carried out this mandate in collaboration with national agencies. Audiovisual documents from the ICRC archives documenting its action during the post-war period (542 photos), see also the films Inter arma caritas (1948) and Helft helfen ! (1948). 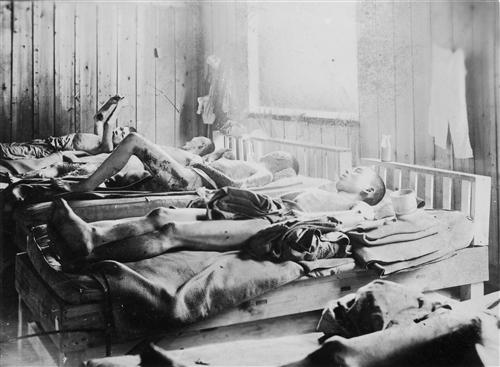 This article by an ICRC delegate recounts the organization’s action for the compensation of victims of the inhumane pseudo-medical experiments conducted in the Nazi concentration camps. Filmed in Berlin in 1948 at the initiative of the local delegation, the documentary film Helft helfen (24 min) shows civilian populations’ distress after the war and presents the ICRC’s relief activities, prompting the spectator to ‘help those who help’. In an article published in the volume La guerre après la guerre : images et construction des imaginaires de guerre dans l’Europe du XXe siècle, Marina Meier and Daniel Palmieri analyze the historical context of the film’s production as well as the reasons behind its very limited distribution. As the conflict came to an end, tens of thousands of displaced people found themselves without valid identity papers, unable to return to their home country or to emigrate. 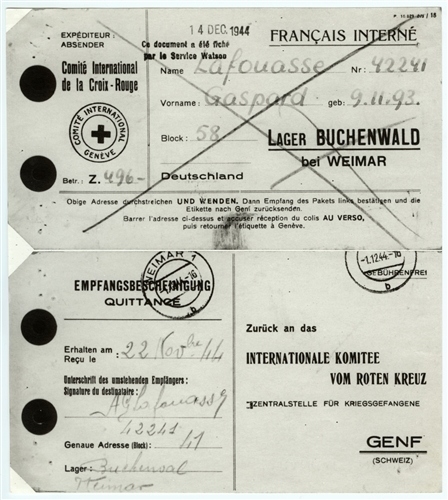 Faced with this exceptional humanitarian crisis, ICRC delegates, soon backed by the institution, began to issue travel documents for undocumented refugees, as had been done in the interwar period to assist the return of prisoners of war to their home country. Finally, around 120,000 travel documents were to be issued in the post-war period by the institution to allow the repatriation or emigration of former prisoners of war, civilian internees, deportees and displaced civilian workers. Overwhelmed by the number of applicants, the institution was not able to prevent cases of fraudulent misuse of those travel documents. Tragically, these cases of fraud include certain Nazi war criminals like Josef Mengele and Klaus Barbie obtaining them under false identities to flee Europe. For more information on this topic, see the articles “Refugees on the run”: ICRC travel documents in the aftermath of the Second World War by Irène Herrmann and Daniel Palmieri (2013), Le Comité international de la Croix-Rouge et les organisations pour les réfugiés by Daniel Palmieri (2012) and the master’s thesis by Sophie Cornu Les titres de voyage du CICR au lendemain de la Seconde Guerre mondiale (2009). 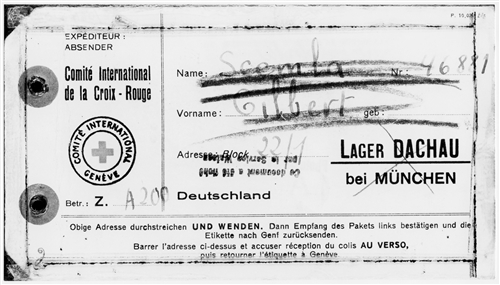 For further information about the ICRC’s WWII individual archives, including travel documents, see the webpage Researching victims of conflict. Our publications on the development of international humanitarian and criminal law in the post-war period: see the article Prosecuting War Crimes after the Second World War: The Nuremberg and Tokyo Trials and our research guide Drafting history of the 1949 Geneva Conventions. The ICRC Library’s collection includes a series of books authored by or about former ICRC delegates. Documenting their work during the war, these publications act today as precious testimonies of the history of the organization. In Warrior without weapons (1951), Marcel Junod recounts his missions as a medical delegate for the ICRC from 1935 to 1945, in Abyssinia, Spain, Poland, Germany, and Japan. A publication by the World Holocaust Remembrance Center Yad Vashem, Friedrich Born: “a righteous among the nations”, pays tribute to the ICRC delegate Friedrich Born, recognized in 1987 as Righteous Among the Nations, who engaged in relief, rescue and resistance operations in Hungary between 1944 and 1945 and helped save thousands of Jews from the death camps. In French, Georges Dunand relates in Ne perdez pas leur trace ! his work as a delegate in Slovakia from the fall of 1944 to the liberation. Several films produced by the ICRC between 1987 and 2013 discuss its role during the conflict, notably giving a voice to the actors of the era ; watch them online on the ICRC’s audiovisual archives portal. André Durand, History of the International Committee of the Red Cross: from Sarajevo to Hiroshima, 1984, p. 400 – 401. « The Geneva Conventions which were adopted before 1949 were concerned with combatants only, not with civilians (…) The events of World War II showed the disastrous consequences of the absence of a convention for the protection of civilians in wartime. » For more information: Convention (IV) relative to the Protection of Civilian Persons in Time of War. Geneva, 12 August 1949. This policy document represents the ICRC’s official stance on the Nazi genocide. It is part of the ICRC doctrine, a body of documents adopted by the institution’s Assembly with a view to provide long-term guidance for its action. See here our research guide dedicated to the ICRC policy documents. Jean-François Pitteloud, Un nouveau règlement d’accès ouvre les archives du Comité international de la Croix-Rouge à la recherche historique et au public, Revue internationale de la Croix-Rouge, Vol 78, no 821, octobre 1996, p. 595-597. Since June 15 2015, the archives are opened to the public for the years 1863 – 1975.